Affluent Millennials are a newly emerging persona demanding the attention of financial firms around the world. These individuals born from 1981 to 1997 hold at least $100,000 in investable assets excluding real estate. They spend a staggering $2 trillion annually and stand to inherit at least $59 trillion in the coming years. LinkedIn and Ipsos conducted a global study of approximately 9,200 Millennial and GenX Internet users across 10 countries. This three-part blog series focuses on 1,507 respondents from the United States and provides insights about this powerful generational subset. Last week’s post explored how Affluent Millennials are dramatically reshaping the future of the finance industry. This week, the focus is on what Affluent Millennials are doing to prepare for their future today. of how they gained their wealth. 39% of the 52% of Affluent Millennials stated employment wages as a primary source of how they gained their wealth. Where are Affluent Millennials generating their income outside employment wages? Affluent Millennials are especially likely to be building their wealth through investments and income properties, as well as gaining assets through inheritance. Two-thirds of Affluent Millennials have at least one loan, other than a mortgage, including credit cards, personal loans, student loans and business loans. 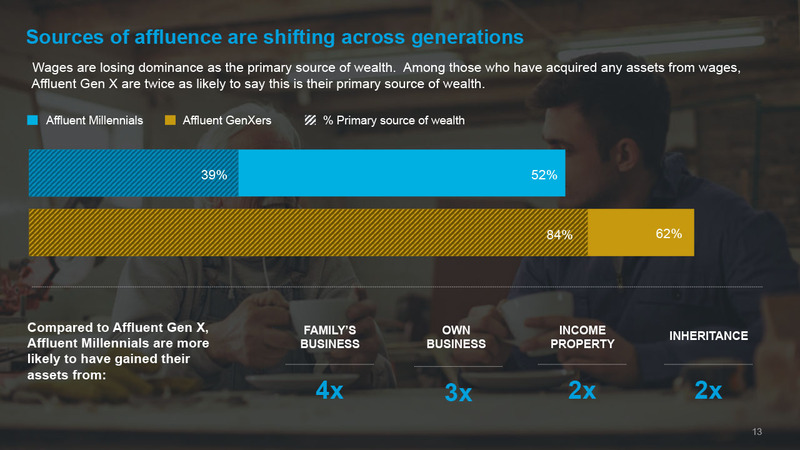 This is significantly more than Affluent GenXers, of which approximately half are in similar debt situations. In spite of their debt, Affluent Millennials are also saving. 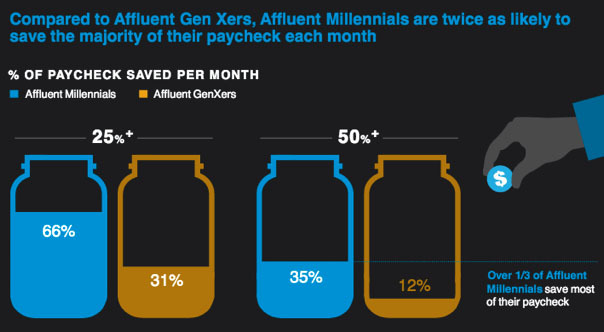 More than a third put the majority of each paycheck into savings vs. just 12% of Affluent GenXers who do the same. Affluent Millennials want to conduct their own research, make their own investments and execute their own financial strategies. However, 87% of Affluent Millennials also view financial advisors as either “nice to have” or as a “must-have”. 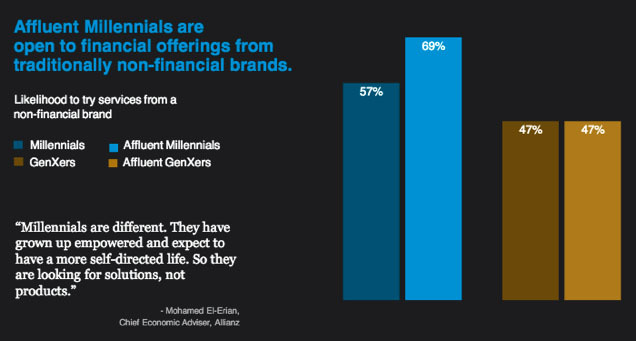 Two out of three Affluent Millennials are open to trying financial products or services offered by brands NOT within the finance industry. That’s 22% more than GenXers. 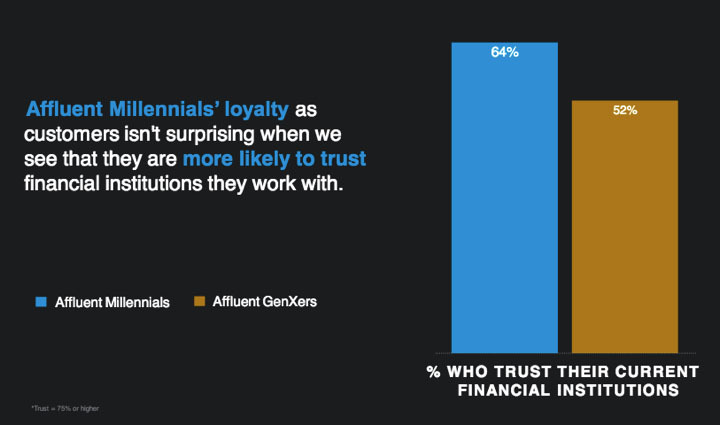 Additionally, the study found that Affluent Millennials are three times more likely to trust the financial institutions they choose to work with. This openness and subsequent loyalty among Affluent Millennials could lead to a substantial loss of clients to brands outside the finance industry as they release new products and services that appeal to the preferences of Affluent Millennials. 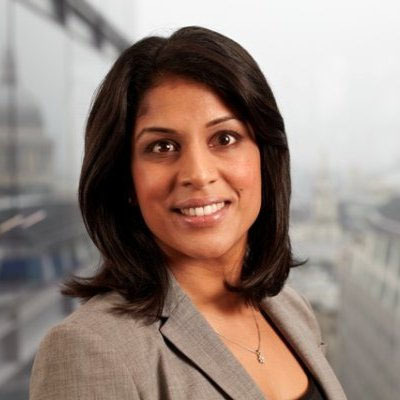 Subscribe to the LinkedIn Marketing Solutions blog now to ensure you receive the final post in this series, which will examine what Affluent Millennials are seeking in financial services providers. 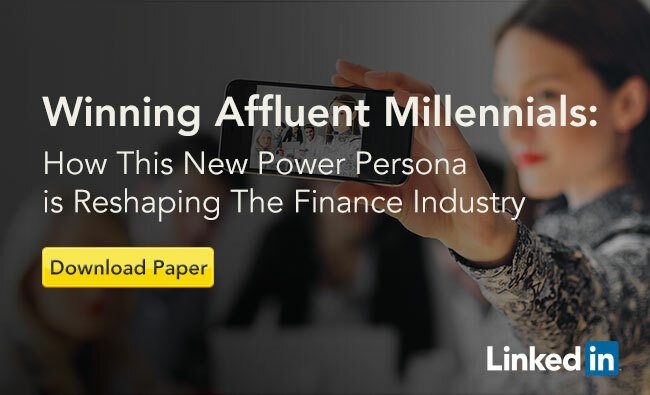 For a complete summary of the research, download the whitepaper Winning Affluent Millennials: How This New Power Persona is Reshaping The Finance Industry.